After leaving Kingston upon Hull we realised it was still too early to head straight back to London. A quick scan of the map revealed that we were only about 55 miles from the ruins of Rievaulx Abbey in North York Moors National Park so we decided to head there. 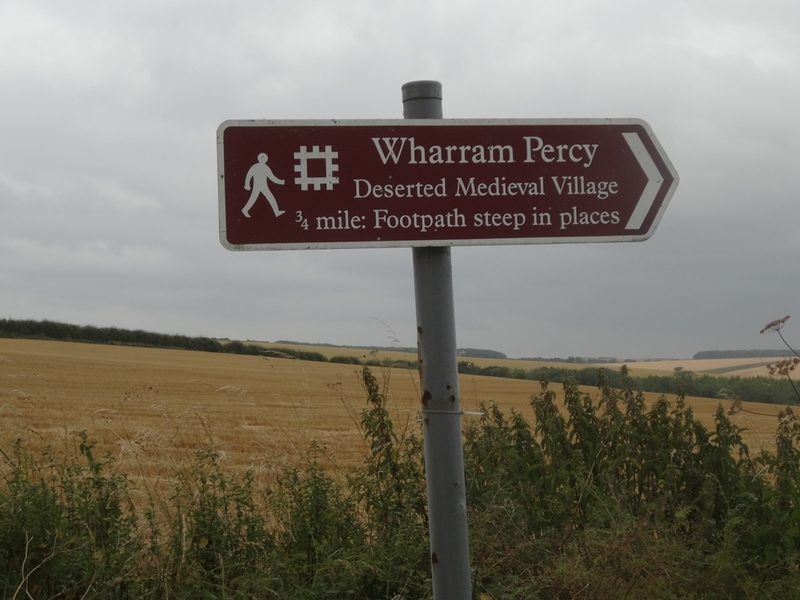 While driving through the rural Yorkshire we spotted signs leading to place called: “Wharram Percy Deserted Medieval Village”. Deserted? Medieval? We simply had to see it. It took as a while to navigate the small country lanes and to find the parking lot at the beginning of a short trail leading to the site itself, but it was well worth the effort. After a short brisk walk we reached the location of the village. 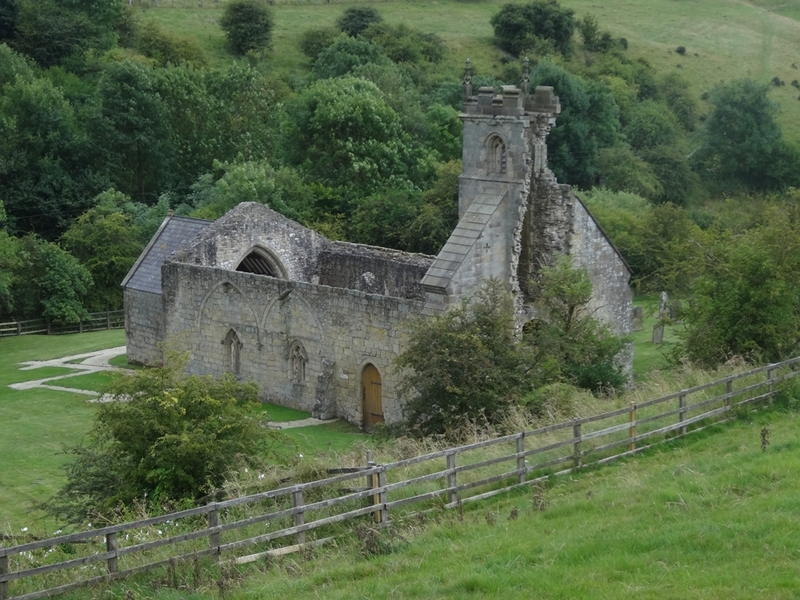 Nowadays only the ruined church is easily visible above ground, much more of the village layout can be seen in the surrounding fields. The place is in the care of English Heritage which installed informative panels around the site. Apparently it wasn’t the “Black Death” of 1348-1349 which lead to desertion of the village but changes in prices and wages in the 15th century, which gave pastoral farming (particularly of sheep) an advantage over traditional cereal farming. So basically it was the market forces rather than some natural disaster which led to its demise. We roamed the picturesque site for a while, taking lots of pictures and thinking why on earth would anyone call Britain a “crowded little Island” with remote places like this one. Especially atmospheric was the ruined church with its small graveyard. From Wharram Percy it is normally only a short drive to Rievaulx Abbey which, fortunately, was much better signposted. Unfortunately we got stuck in holiday traffic in quaint towns of Norton, Malton and Helmsley. 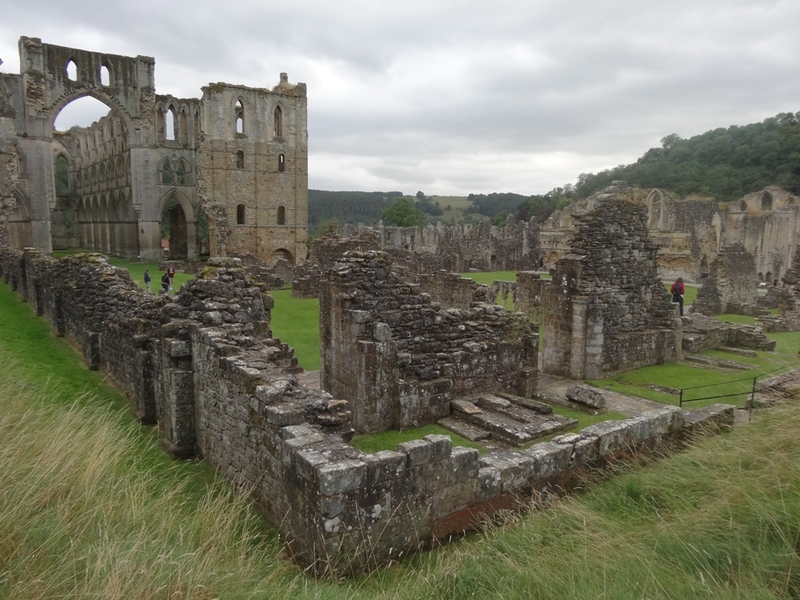 The abbey, founded in 1132 by twelve monks from Clairvaux Abbey, was one of the first Cistercian houses to be established in England, and was meant to act as an administration centre for Cistercian missionary work in the north of England and into Scotland. 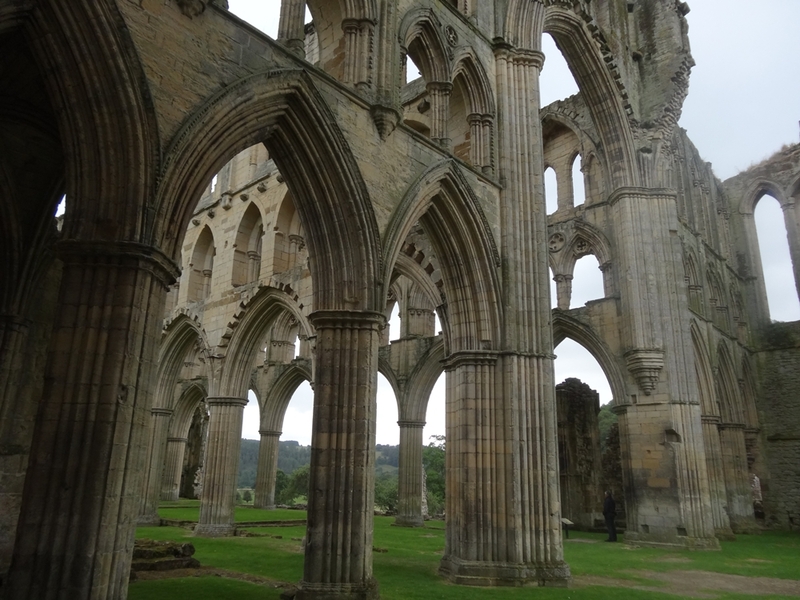 The name Rievaulx is a Norman concoction, a misuse of Rye Vallis, or Rye Valley. It lies in a beautiful wooded dale by the River Rye, sheltered by hills. The abbey was dissolved by King Henry VIII in 1538 who ordered the buildings to be rendered uninhabitable and stripped of valuables such as lead. 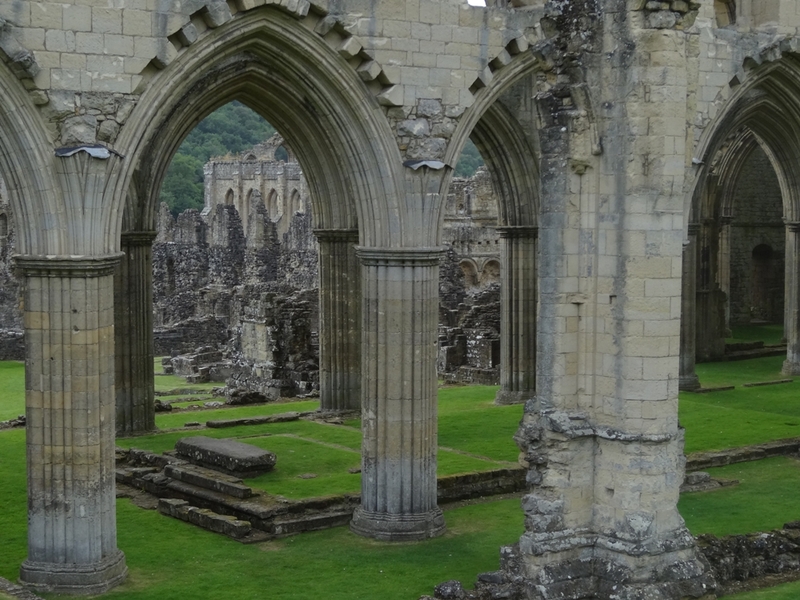 Today Rievaulx is one of the most complete, and atmospheric, of England’s abbey ruins. I found the site absolutely fascinating. It helps that I like medieval history and Gothic architecture but I guess most people would enjoy rambling across a dark ruined abbey on a misty day. The most impressive part of the complex are the ruins of the main church with its massive columns and arches pointing skywards, with the roof missing and grass instead of a stone floor. Then there are remains of the cloisters, kitchens and refectory, only a little bit less impressive than the church. Usually I’m a bit sceptical about the audio-guides offered at sites like this one but as it was free for the English Heritage members we decided to use them and it was a good idea. You can listen to the “monks” explaining their daily life while walking through the ruins trying to imagine how it all looked before the dissolution. As ruins go Rievaulx is definitely one of the most impressive I have ever seen, well worth the extra drive to get there. From the abbey we drove west toward the A1 but before getting to it we decided to stop at the National Park Visitor Centre, right off the A170 at Sutton Bank. Basically we needed a loo break. 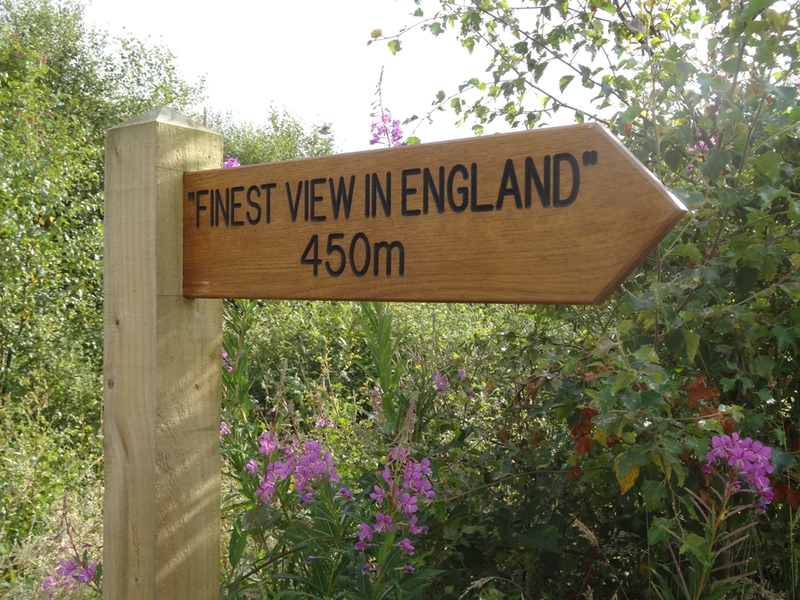 While there we spotted a sign pointing to the “finest view in England”. True or not we had to check it out, especially as the sky cleared and there was beautiful late afternoon sunshine. After a short trek we reached the edge of high escarpment offering a spectacular vista. I’m not sure it it is “the finest in England” but the views over the Vale of York and the Vale of Mowbray were splendid indeed, especially in the low afternoon sun. We must have been so mesmerized by the view that we got lost on our way back to the car even though it was only a few hundred yards away. From Thirsk it was a long drive back south to the big smoke of London. What made it even longer was miles of road works and speed limits on the M1. We only managed to get back home way after midnight after getting lost when a closure on the M1 forced us onto local streets of the far north of London (basically foreign territory for someone like me living south of the river). 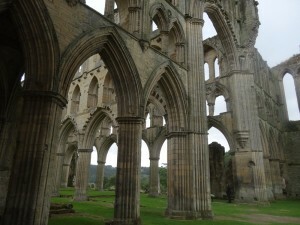 Overall our two day trip to Humberside and Yorkshire offered variety of sites and attractions. From the modern engineering of the Humber Bridge to a deserted medieval village and Gothic cathedrals. 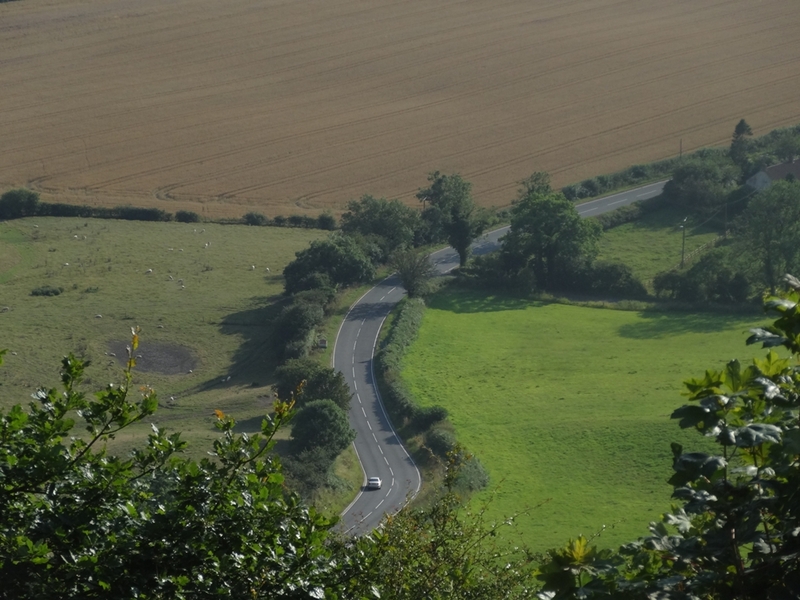 From industrial detritus on the banks of the Humber to the picturesque York Moors National Park. All equally worth seeing. I would recommend a trip like that to anyone and I’m already planning more. 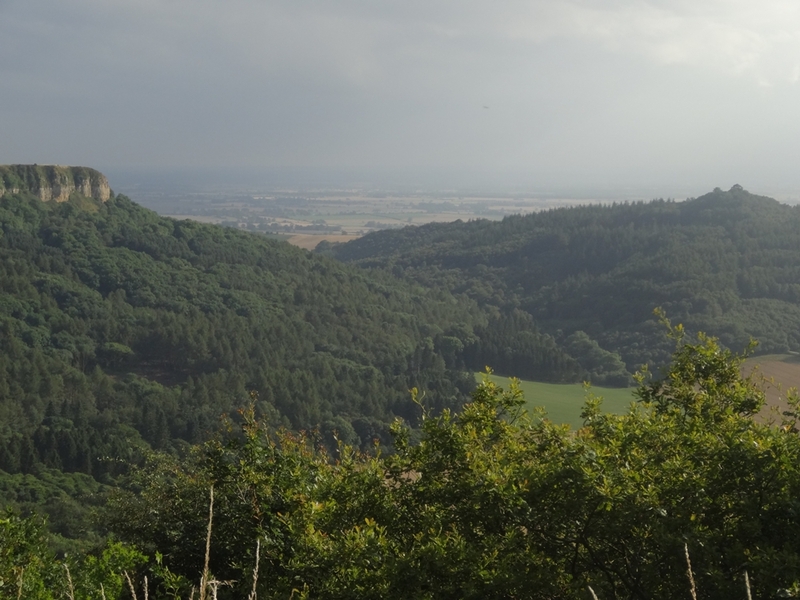 This entry was posted in Uncategorized and tagged North York Moors National Park, Rievaulx Abbey, Sutton Bank, Thirsk, Wharram Percy Deserted Medieval Village by Geogregor. Bookmark the permalink.